These enzymes are highly effective in metabolizing the typical organic compounds found in industrial wastewater, particularly food manufacturing wastewater and pup and paper wastewater. If you are having troubles with industrial wastewater treatment at your wastewater facility, Contact Custom Biologicals. Custom has over twenty years experience with industrial wastewater treatment and the use of biological products at wastewater treatment plants. We specialize in customizing solutions for difficult industrial wastewater treatment problems. 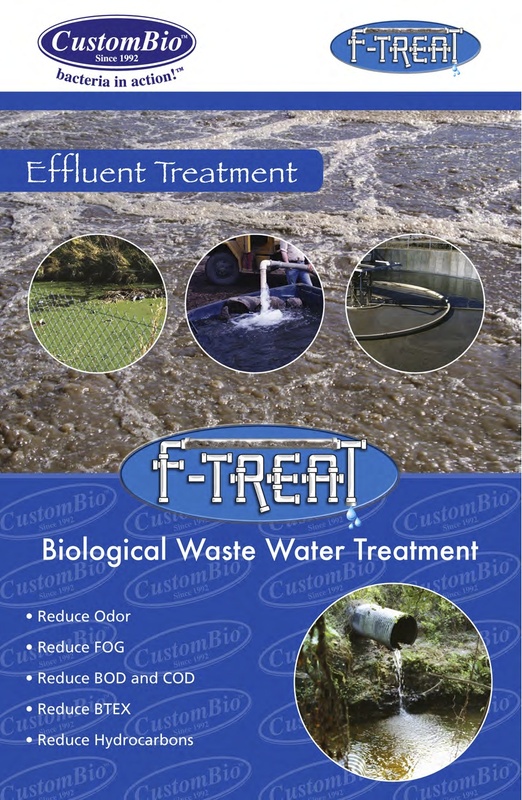 Custom Biologicals manufactures a wide variety of environmental products for use in the environmental industry inculding F-TREAT. F-TREAT is available as a ready to use liquid, as a concentrated liquid, and as a slow release tablet, F-TREAT Tabs. Custom welcomes dealer and distributor inquires, both domestic and international.